Race to Dubai gone by 2010? The European Tour took a giant leap of faith in Dubai when it decided to join forces with a developer and create the $20 million Race to Dubai concept. European tour players, Justin Rose, Darren Clarke, Srgio Garcia and Martin Kaymer with Leisurecorp sponsorship at the race to Dubai launch. And why wouldn’t it. It was a chance to keep pace with the US PGA and finally embrace a concept where they could attract more top class players from the USA to its tour. No one else in the world was prepared to offer that sort of money to the tour at the time. 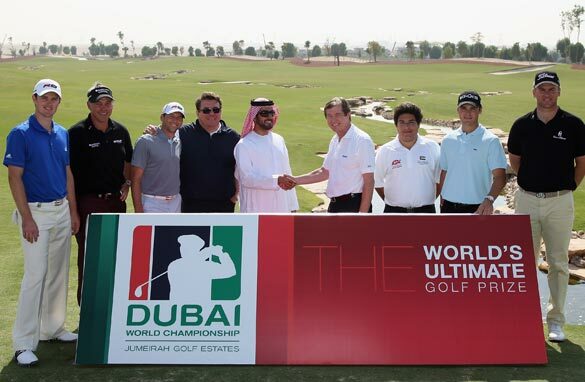 The RTD (race to Dubai) brought with it the world’s richest tournament in the Dubai World championship – a marketing dream for the tour. “It’s locked in – a five-year-deal and so is the money” we were told with great confidence by tour officials and Leisurecorp during the announcement a few years back. Those assurances proved to be quite hollow. Sadly European Tour boss George O’Grady has spent the last few months trying to save the concept from being completely wiped out before the end of the first season. Leisurecorp is now no longer a solo operation and parent company Nakheel oversees everything. Nakheel is debt laden and from what I have been told spending a vast fortune on the Race to Dubai is seen as very undesirable. With that in mind, a 25 per cent reduction in the total prize pool for the Dubai World Championship and the Race to Dubai is not a bad result to be honest. It could have been a lot worse my sources tell me. The same players who told me about the prize money reduction before it was announced are also warning that the Race to Dubai will be nothing more than a bad memory for the European Tour next year. It will be back to where it started with the old Order of Merit system and now multi-million dollar prize pool.